Jen Michelsen serves the San Lorenzo Valley Water District as Environmental Programs Manager, a position she has held since 2014. Jen also serves as a director on three boards, including the Santa Cruz Mountains Bioregional Council, Safe Water International, and Fire Safe Santa Cruz County Council and is a member of the Santa Cruz Mountains Stewardship Network. 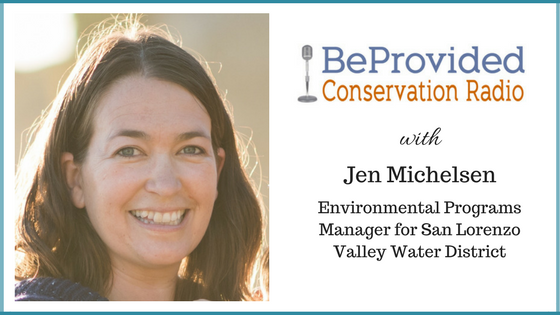 Prior to joining SLVWD, Jen spent 10 years serving the County of Santa Cruz, Environmental Health Department, in the Water Resources Division. Jen’s experience includes 18+ years of water resource management, long range water sustainability planning, water quality, environmental compliance, watershed management/stewardship, fish & wildlife species richness abundance studies, community engagement, water conservation, and habitat restoration. Jen began her career serving in the Peace Corps in Guatemala, working on water quality issues in a rural indigenous community. Jen holds Bachelors of Science, Biology, with an emphasis in Natural Resource Conservation, from the Sacramento State University. Jen is also a mother of a clever 2.5 year old girl who loves animals. She spends weekends camping, hiking, and birding with her family. Jen has traveled to over 20 countries, loves learning, reading, scuba diving, backpacking, yoga, cultural diversity, and fresh clean water.